What's at PYI this year? Returning after overwhelming response are our Advanced-level sessions – intended for established writers and illustrators – as well as a session for Beginners. All other sessions are at the Intermediate level. The entire day, including Welcome and Keynote speakers and three workshops of your choice, is only $125.00 for Virtual PYI. Enjoy a Welcome Address for all registrants from Governor General's Award Winner Teresa Toten. Attend three workshops chosen from your interests, and network over lunch. Re-join all registrants for an inspirational Keynote to wrap up the day from GG winning author Susin Nielsen! Refund Policy: Cancellation fee is $45 before September 5. No refund after September 5. 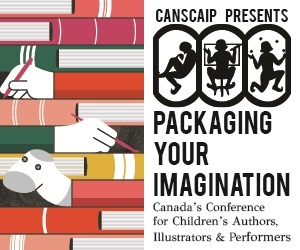 For more information, please email office@canscaip.org or call (416) 515-1559. "On Your Mark! Get Set..."
A broad range of serious issues affect the world today, but that doesn’t mean you shouldn’t be writing about them. Children are already interested, engaged, informed and want to learn more. This workshop will look at Rob’s process for researching and writing engaging, fun and informative children’s non-fiction books about animal issues. Some details will win your readers' hearts forever -- and some will make them skim and sigh impatiently. Which ones are which, and how do you know? Award-winning author Erin Bow will walk you through it, using lots of examples from current teen books. Debbie will explain how an effective author or illustrator brand can give you a major edge in finding agents, landing book deals and marketing your work. She’ll also offer practical tips on how to find your own authentic brand as well as how to build it online. Cybèle will share the story of her development as a fine artist venturing into children's books and how the two areas merge and inform one another. Exploring the image/text connection through different mediums, she will reveal her different approaches in process and technique. There will be physical examples and hands-on experimenting. No diagrams, charts or spreadsheets. Approach your plot structure organically instead of mechanically. This workshop will explore techniques and methods for building in pacing, “arc” and flow from the inside of the story outward. A hands-on workshop that will give you tools and techniques to adapt your novel or short story into a play or script. Picture books and graphic novels are completely different, right? From draft, to storyboard, to final art, follow the surprisingly similar path that both mediums take on their way to becoming a finished book. Some weeks before this workshop, Matt will provide participants with a choice of classic stories to develop into a 32-page picture book, as far as they can. They’ll be expected to bring thumbnails of their story, and hopefully a few pages of linears and/or finals to the workshop for critique and discussion. The panel will discuss "The State of the State"
Master Level Writing: Whose Voice Is It, Anyway? We’ll explore how writers channel and manipulate the fictional “child’s” voice, the relationship between voice and point of view, how writers can distinguish their own writerly voice from that of their characters, and why these issues are so important for those who write for young readers. This workshop is for published authors and illustrators who want to learn how to promote themselves on social media. Holly will show them how they can reach readers on the following social media platforms: Facebook, Twitter, Tumblr, Instagram, Pinterest, Goodreads, and the 49th Shelf. "Confessions of a Word Nerd"
New to CANSCAIP? Want to find out what being CANSCAIP Friend is all about? Join the community and keep growing as a writer or illustrator. Expand on what you learn from our exciting lineup of workshops and grow your network of children's culture creators as well. How? By joining CANSCAIP as a Friend! As a Friend you receive our quarterly newsletter, The CANSCAIP News, featuring profiles of our professional members explaining how they practice their craft, up-to-date marketing information and cross-country news about what’s happening in the children's literature community. On our website, you have access by password to a Members/Friends-only section that includes useful and informative articles plus a Critique Exchange. As a first-time Friend, join at the special PYI fee of $35 (regularly $45) when you send your application with your registration form. CANSCAIP acknowledges the generous support of our conference partner Humber College School of Creative and Performing Arts.